We know so many families want to travel more with their kids, but they can’t figure out how to make the logistics and finances work. 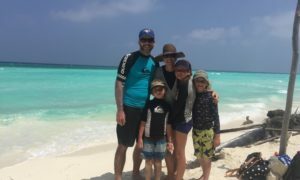 We recently published a popular post entitled How You Can Travel More as a Family where we discussed different approaches families are using to travel more together. This post got so much love that it was even featured on the Lonely Planet Kids’ Top Blogs in November last year (happy dance!). Some of these travel approaches involved drastic steps like planning and saving for a one year RTW (round the world) trip. Some of them involved smaller adjustments like using house swapping or house sitting websites. From that post, we learned that families are looking for more information about how to use those approaches. They want to know what steps they need to take, how they can afford it and they want to hear from families that are using these strategies. From that, our new case study series was born. Twice monthly you will hear from a family using one of these approaches to travel more. We hope you find these stories inspirational, but also provide helpful building blocks to show you how you can apply them to your family’s travels. 1.1 1. Tell us a little bit about your family and your history with travel. 1.2 2. When did you first get interested in a digital nomad lifestyle? Why did you choose it and what steps did you take to make it a reality. 1.3 3. What do you like the most about being digital nomads? 1.4 4. What has been the most challenging part of this lifestyle? 1.5 5. Can you tell us about some of your favourite places you have visited. 1.6 6. What about schooling and socialization for your daughter? 1.7 8. What’s your travel style? 1.8 9. What does a typical day look like for your family? 1.9 10. What advice would you give to families thinking about becoming digital nomads? 1.10 11. Are they any resources families can check out if they are considering this lifestyle? 1.11 12. What does the future hold? Where are you headed next? 1.12 More digital nomad questions? 1.12.1 Enjoyed Reading this Post? SIGN UP for more. 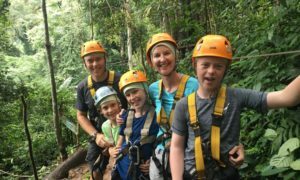 First up this week we have Suewan, Dan and Roobs from RTW Families who became a digital nomad family two years ago when they left the UK for their world travel adventures. 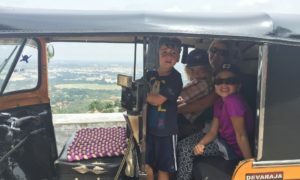 On their blog, they focus on the good, bad and ugly of long term family travel. Before we dive into the interview, let’s have a look at what the term digital nomad means. I probably first started hearing this term about 5 years ago and we ourselves have even toyed with becoming digital nomads. A digital nomad works remotely via technology and is location independent. This means they are not based in one location, but have the freedom to travel indefinitely as long as they have access to WIFI to work. This lifestyle is growing quickly with millennials, but increasingly with families as well. I think you will find Suewan and Dan’s story hugely inspirational and I love how they break down the steps they took to make this lifestyle a reality. 1. Tell us a little bit about your family and your history with travel. Before we became parents we had travelled a fair bit. Suewan studied languages at university and had spent a year living and working in France and Germany as part of her degree. After university both of us wanted to live abroad for a bit and we ended up spending a year in Hong Kong and a year in Japan with both of us teaching English. 2. When did you first get interested in a digital nomad lifestyle? Why did you choose it and what steps did you take to make it a reality. A few years ago a number of things happened which made us question our lifestyle. A close friend of ours died very suddenly. He was young and had just returned from travelling which was something he had been really looking forward to. It was a huge shock and made us realise how much we take for granted. At the same time we were also starting to question why we had so much ‘stuff’. We had a lovely house, a car, heaps of toys for our daughter, all the usual stuff that accumulates as part of normal family life. We were starting to feel a little uncomfortable about having so many comforts (sounds weird I know!). Suewan was reading some books such as ‘A Million Miles in A Thousand Years’ by Donald Miller and ‘The 4 Hour Work Week’ by Tim Ferris. These books really inspired us to consider that life could be very different. We talk on our blog in more in-depth about our reasons for travelling long term. 3. What do you like the most about being digital nomads? There are so many things! If I had to name the best thing it would probably be the freedom. Freedom to live in a way which suits us. Freedom to manage our own time. 4. What has been the most challenging part of this lifestyle? Being removed from our family and friends back home. We are good at connecting to other travelling families and locals as we travel but we still miss our community back home. We try to stay in touch through video calls, emails and even snail mail but it’s not the same as having a chat over a cuppa. We know we’ve missed out on some big life events that our family and friends have gone through and it is hard to not be able to give physical hugs. However, we are heading home for a visit soon and we hope to catch up with everyone. 5. Can you tell us about some of your favourite places you have visited. We loved being in Athens. Partly because of the history, culture and delicious food. And partly because Suewan and Roobs were able to volunteer there in a community centre set up to support refugees. Valencia also comes to mind. It’s a small city on the east coast of Spain and we love that the city is big enough to explore but small enough to feel you can navigate it fairly easily. We always enjoy places that are close to a beach and Valencia city is only 20 mins bus/tram ride away from Malvarossa beach. We found there were lots of family friendly activities there. Chiang Mai is one of our favourite places in South East Asia. It is a real travelling families hub so we were able to meet up with loads of other families there. We were there in April/May so we experienced Songkran (Thai new year). It was the craziest, most fun festival we’ve ever been in! It is essentially a mammoth water fight! Locals and tourists take to the streets armed with buckets, hoses, water guns and EVERYONE gets soaked. 6. What about schooling and socialization for your daughter? We worldshool our daughter. For us that means that we teach her as we travel and of course she learns from our travels. It took us a while to find our groove with worldschooling but after around 6 months we found a method that works for us. We do a mixture of child-led learning, project work, workbooks, online courses, apps and a private maths tutor. We also tap into local classes and workshops depending on where we are. We wrote about the nitty gritty of our worldschooling method. As for socialization well, this was my number one concern before leaving. As an only child I wanted to make sure she kept in touch with her very dear friends back home. And I wanted to make sure she was able to connect with new kids and friends as we travelled. Because of that we make this my number 1 priority. For her friends back home we make sure we write to them and can also receive post. We travel fairly slowly so receiving post is possible. They also spend time on video calls and send voice messages to each other. For new friends I make sure that when we look into where we are going next I seek out other travelling families, local activities/homeschool groups/classes/workshops so that I know she won’t be isolated. We also choose to go to parks, zoos and kid-friendly places so that she has opportunities to connect. So far we have found it easy to make new friends and we’ve been surprised at how adaptable and confident she has become. Yes, some of these friendships are fleeting and only last the short time we are together. However she has also made lasting friendships where she’s been able to stay in touch and even meet somewhere else on the globe! We travel slowly, usually spending between 1-2 months in each place. We do this because we find that we all need that stability. Dan needs time to find and get settled into a coworking space. It gives us enough time to get Roobs involved in local activities and classes. We don’t feel rushed and we feel able to relax and really get to know a place well. We have tried travelling faster and it is a complete disaster for our family! 9. What does a typical day look like for your family? Haha! There is no such thing as it really depends where we are. I will give you a typical day of our life now as we are in Hoi An, Vietnam. Morning: Wake up, breakfast at home as a family. Dan heads to co-working space. Lunch: Meet other travelling families at local coffee shop. Playtime, lunch and coffee. Afternoon: This is when Roobs is at her best to do worldschooling. We will talk about what she wants to do, look at any ongoing projects she might have and choose which stuff to do today. Today she chose to continue building a Minecraft replica of the ancient My Son vietnamese ruins we visited a few weeks ago. She had an online maths class with her tutor (this happens once a week). She started writing up a blog post about other travelling kids she has interviewed. And she practiced a poem she is learning for World Book Day. Evening: Walked to the local market to get some food. Head home to cook and eat dinner. Video call grandparents back home. Bedtime for Roobs. Time for a cuppa for me and Dan. 10. 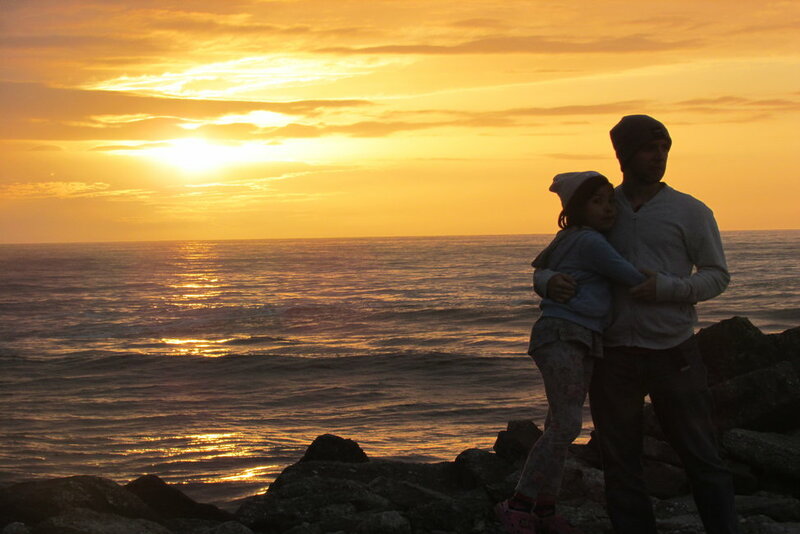 What advice would you give to families thinking about becoming digital nomads? Don’t wait for the perfect time. You don’t know what tomorrow holds so if this is your dream then make it happen as soon as you can. You don’t need tens of thousands of pounds. You don’t need to have everything planned out in front of you. Find a way to make an income. Get rid of your stuff. Sort out the logistics of living out of suitcases and GO! 11. Are they any resources families can check out if they are considering this lifestyle? Of course I would suggest our website as that is why we are writing it! We found it hard to gather information about long-term family travel when we left so we wanted to fix that. Also look up Facebook groups “Worldschoolers”, “Digital Nomad Families” and “Families on the move”. 12. What does the future hold? Where are you headed next? Well, Singapore for a very brief 3 day visit. And then we are heading home for a short spell in England. We haven’t been back in 2 years so it’s about time to touch base with our friends and family back home. After that we are plotting some time in Europe but no decisions on exactly where yet. Not knowing is half the fun! Hop on over to Suewan and Dan’s site, RTW Families for lots of great resources and inspiration. You can also follow them on Instagram or Twitter. Let us know in the comments what questions you have about the digital nomad lifestyle. Is it something you are considering with your family? Note: this post does contain affiliate links, please see our Disclaimer page. What a great series this will be Dawn. I loved this story from RTW families. I look forward to reading many more! Thanks Sharee! I am really excited about sharing more stories in the rest of the series. Thanks this is a fun read — and loved seeing how RTW families actually do it! I had so many questions about how to do this and you answered them all. We have an only child and I just wrote off travelling RTW with her. This makes me feel like it’s do-able. So glad it was helpful Jody! I found their story super inspirational and I love that they shared the good, but also the challenges. Love this post! It’s so interesting to read about a particular family, their story, why they travel full time, what’s hard and what they love about it. It’s very inspirational! Thanks Dianne – glad you enjoyed it! I also love hearing personal stories and getting to know a fellow travel loving family. Lots more to come in this series. Next one comes out on the 19th! That’s where we are at right now Tamara, but I am always tempted!